Drifter | Products | Kurita Sakuganki K.K. KD-1ST Drifter rotates separately from the strike mechanism. 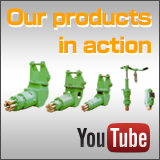 Rotary motor torque is large, allowing the use of large diameter bit. KD-4 Drifter was developed for taphole opening, and is capable of both forward and backward (reverse) strike with 1 cylinder. KD-1HG Drifter has strong strike mechanism and can be used for both crushing and boring (drilling, punching). KD-1H Hammer only has strike mechanism and is capable of both forward and backward strike with 1 cylinder. 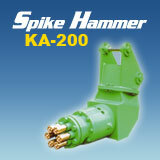 KDB-300 Hammer only has strike mechanism and is capable of both forward and backward strike. It exerts strong striking power and is used for blast furnace sampler. Rotary motor can be installed.